Fear gripped our hearts as we held hands and tried to figure out what we were going to do. Without a dime in savings, my husband and I had both lost our jobs that afternoon. We’d celebrated my 20th birthday just weeks before and I was due to deliver our first baby in less than two months. With no job prospects in sight, we made a rapid decision to open our own business right away instead of waiting several years like we’d originally planned. In order to succeed though, we needed to learn a lot about finances. And I do mean a lot. From budgeting to business ownership to handling endless taxes, we quickly learned that we were never going to succeed financially unless we became great managers of our money. Those principles are true for everyone, not just business owners: we can either learn to control our money or our money will forever control us. And since those of us who struggle with keeping organized homes often struggle with keeping our finances organized, I want to share these fabulous resources that can help you get your financial clutter under control. Dave Ramsey’s The Total Money Makeover completely changed the way my husband and I view our finances. Like Ramsey says, we can either tell our money where to go or we can wonder where it went. I wish I could give a copy of this book to every person in America, but unfortunately I can’t, so head to your local library and borrow a copy of The Total Money Makeover. If you’re in a job you dislike or want to start a career that you love, then you will be able to learn from this incredibly inspiring, gut-wrenchingly honest book. Quitter is about using your current job position, regardless of where you’re working, to help propel you forward in life or your career. Do you want to do something amazing but are terrified to even try? Or maybe you’ve attempted achieving your dream but fear held you back from giving it your all. If so, then Start would be a fabulous book to read. Just like a coach wouldn’t be without a playbook, a business owner shouldn’t be without a solid business manual. Entreleadership is that manual. From hiring (and firing) employees to making financial decisions and working towards business growth, this book covers just about everything a business owner needs to know in order to have a successful and thriving career. My husband and I read much of Entreleadership together a couple of years ago and his company hasn’t been the same since (in a good way!). In Balanced, Tricia Goyer shows moms how they can work from home and be present, engaged parents who thoroughly love and enjoy their children. Tricia didn’t just stop at giving moms permission to work without guilt – she also offered practical tips for how to balance time wisely, how to keep the kids happy while getting through a busy work day, and how to disengage from work when it’s time to put the laptop away. If you’re a blogger, I highly recommend reading How to Blog for Profit! I read this book several months ago and immediately started implementing a few of Ruth’s tips. My readership multiplied tremendously within just the first few days and has been growing steadily ever since. 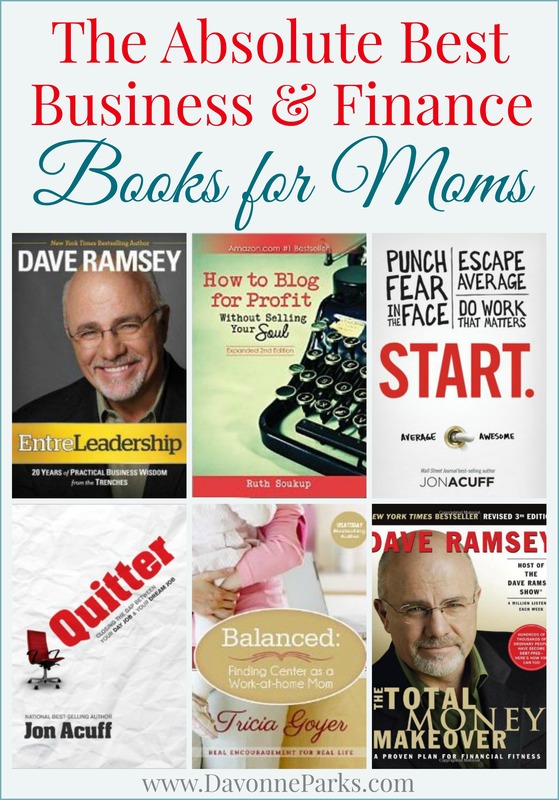 Do you have any favorite money management books? Which book on this list do you want to read? Your clutter may be costing you $25,000. How I saved $1,000 just by quitting my job. Work or stay home? 10 (mostly unbiased) things to consider. Thanks, Angela! I LOVE Balanced. If you read it, let me know what you think about it!